You can grow eating grapes in almost any well-drained soil with a low pH . Wine grapes are different. Many vintners believe climate and sun, plus differences in terroir--the French word for the special characteristics of geography--give wine special qualities. Terroir stems from the Latin terre, or earth; it loosely translates as “a sense of place” that gives special qualities to wine. If you grow grapes to make wine, the best soil type depends on the kind of wine you want to grow. Clay soils are made of tiny flat mineral particles that swell when they are wet, so clay holds lots of water and doe not drain well. Clay soils stay cool longer in the spring than looser-textured soils. 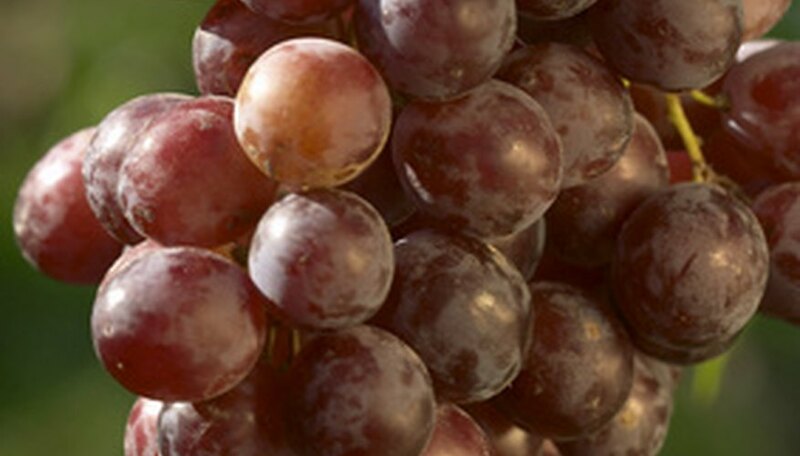 This causes grapes to ripen more slowly, producing grapes that are more acidic and tannic. Clay soils are highly fertile, transferring more nutrients to the vines. Merlot and Chardonnay grapes do well in clay. Silt has particles larger than clay. Called loess, these soils are found in German Austrian regions that produce white wines. Sand has the largest particles and a loose texture. It ordinarily doesn’t hold enough water to produce high-quality grapes. Sand absorbs more sun and is warmer. Chalk, a type of limestone, is soft enough for roots to grow in and is fairly cool. It holds enough water to nourish vines, yet it drains well. Its calcium content makes it alkaline, producing grapes with a high acid content. Chalk limits the growth of the canopy, helping the grapes to ripen. Pure chalk soils, fairly rare, are found in the Champagne, Cognac and Jerez regions of France. Granite and schist are igneous rocks; schist is a mixture of numerous minerals. Soils formed from granite and schist have loose texture and low fertility but drain well. They are found in Germany’s northern Rhone Valley, Portugal’s Douro region, and the Beaujolais area of France. Grapes producing Gamay, Syrah and fruity wines with floral aromas grow well in these soils. Soil composed of gravel, largely quartz, is called conglomerate. Gravel causes soil to heat well and drain freely. This is a good soil for Cabernet and other late-ripening grapes but can cause water stress in Merlot and other varieties. The nature of bedrock often determines the quality of a soil. Soils from limestone, ordinarily formed from fossils of ancient marine life, are high in calcium. Limestone soils can form impenetrable layers that block roots. Soils containing chunks of limestone are called calcareous. The term “marl” describes a crumbly mixture of clay and limestone. The Cote d’Or region in eastern France contains a calcareous marl that produces good Chardonnay. Volcanic soils are made from basalt and other rocks blown out of volcanoes. Volcanic soils of the wine-producing Napa Valley of California have a high mineral content but hold little water; the vines lack vigor but are good for producing wine. What Is the Difference Between Sand Topping Concrete Mix and High Strength Concrete?